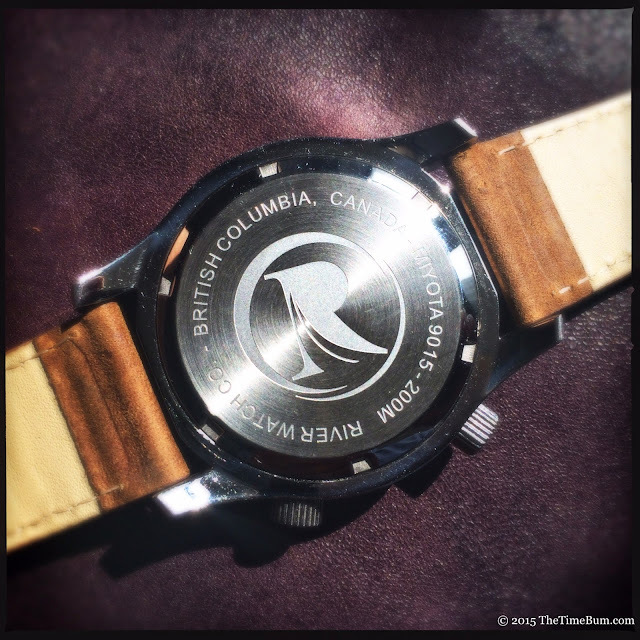 The River Watch Company is a new micro brand from Chilliwack, British Columbia. 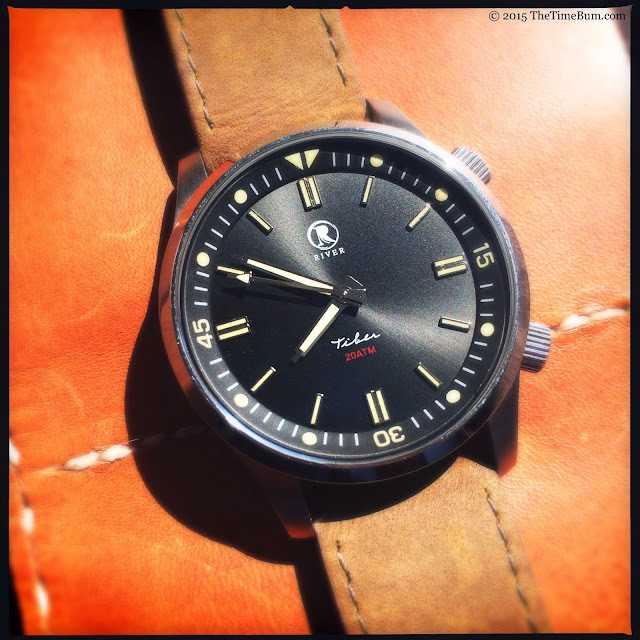 Their inaugural model, the Tiber dual crown, launches on Kickstarter May 18. I first encountered River's founder and designer, Scott Bakker, on Watchuseek where he is a forum regular. Scott is a gainfully employed husband and father, who still saw fit to create his own watch and then let me borrow two prototypes for this review. Why would an otherwise sane and responsible man do such a thing? 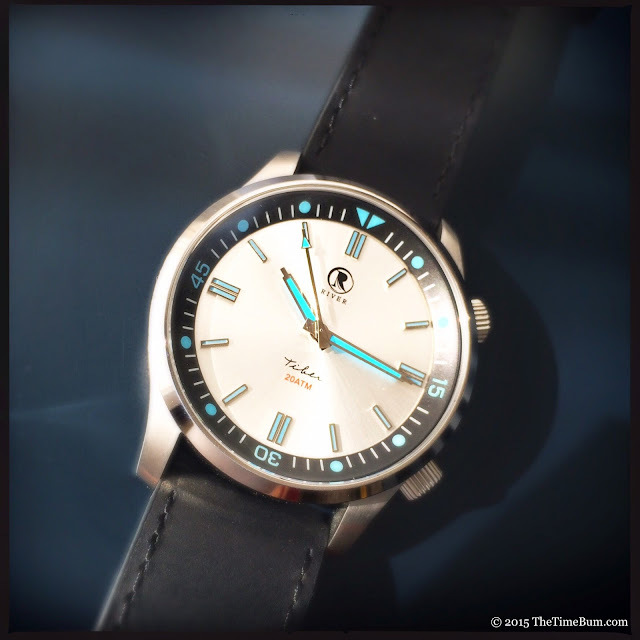 Because he is a die hard watch nerd who wanted the perfect dual crown diver. "Perfect" is an elusive thing, but once the idea takes hold, it is impossible to shake. Unsatisfied with the cost of most watches in this style, and the cost and/or maintenance required of most vintage models, he drew out his pen and graph paper and set to work. Inspired by the classic supercompressor style, he conceived a 42mm dive watch with an internal rotating timing bezel, sun-ray dial, and a Miyota 9015 ticking within. Prototypes are not finished products, of course, but the Tibers showed a high level of fit and finish. The stainless steel case is brushed with a polished outer bezel, and crowns positioned at 2 and 4 o'clock. The lower one is signed and screws in as does the decorated case back. Short, blunt-end lugs keep the overall length to just 50mm. They were an easy fit on my 6.5" wrist and tucked neatly under a shirt cuff. With an aquatic name and a super compressor style case, you would expect dive-worthy water resistance and the Tiber does not disappoint. It is rated for 200 meters. The inner bezel rotates smoothly with a hint of tactile feedback – not a firm snap like an external bezel, but you can feel it rolling over a defined detent. The watch has a flat sapphire crystal with an anti-reflective coating. 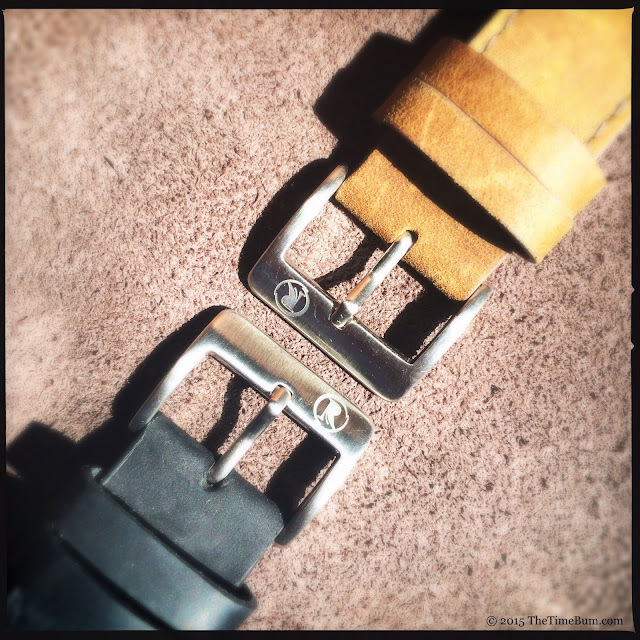 The Tiber's strap is 22mm wide at the lugs, tapering to a signed 20mm pin buckle. Oddly for a dive watch, they are suede. 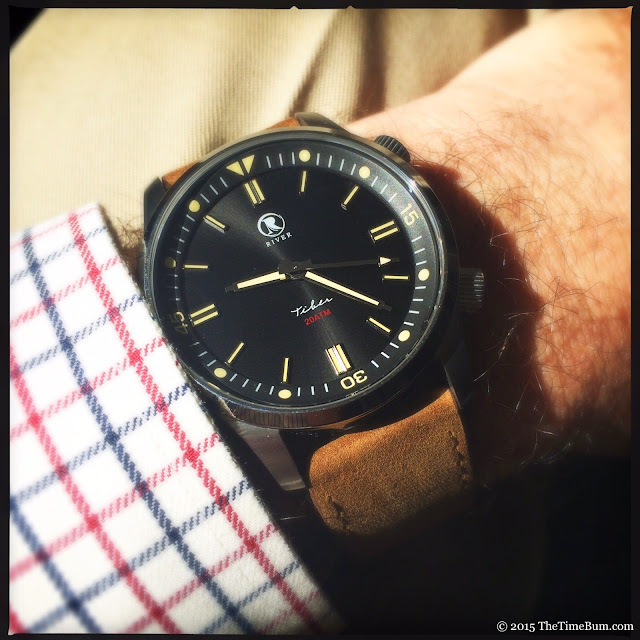 The silver dial wears a black strap and the black dial wears brown. They look great, and honestly, I wear most of my dive watches on leather anyway – but not in the water. Now this may sound a touch hypocritical coming from a man with a drawer full of unused rubber straps, but it stuck me as odd that the Tiber did not come with a waterproof band or a bracelet option. This may be soon corrected as one of the stretch goals will be a custom designed nylon NATO from the Ague Trading Company. 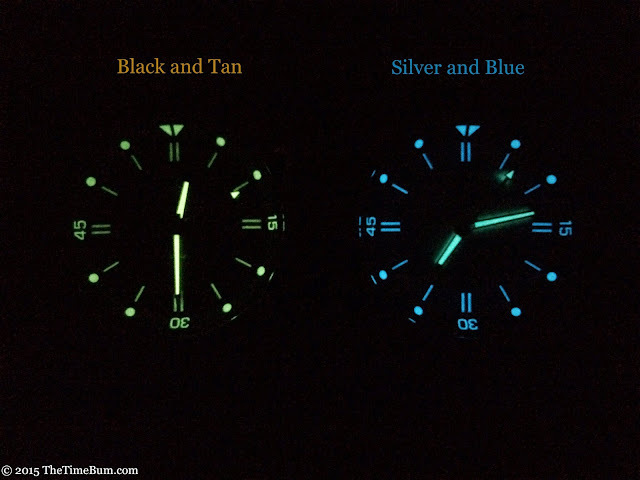 Two colorways are offered: a black dial with tan, and a silver dial with blue. Both have black internal bezels with a printed white index and color pips. 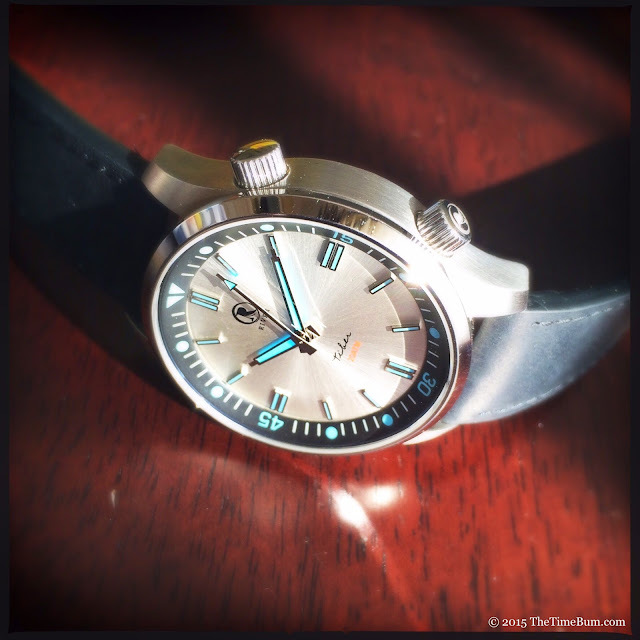 Applied, bar-shaped markers are polished and filled with colored lume, as are the hands and bezel. The dial text is particularly well thought out. The River logo at the top is simple, attractive, and properly sized. The model name is printed in a clear "handwritten" script with "20 ATM" in a pop of red below. 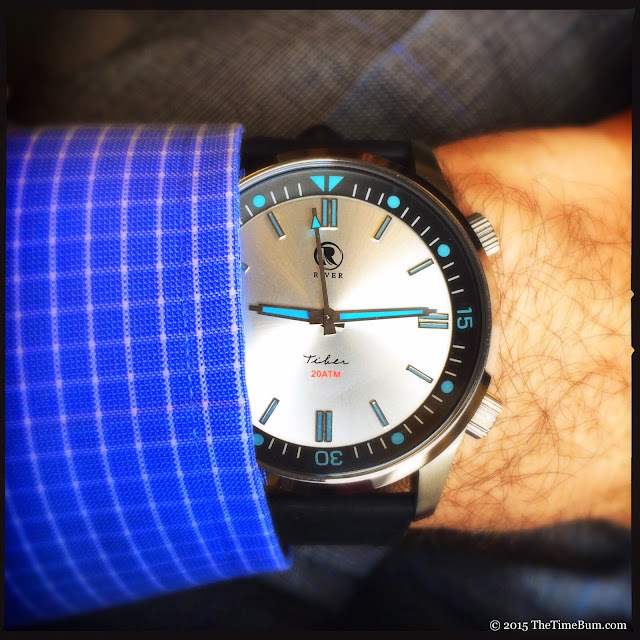 Both dials are attractive, but I am partial to the silver and blue as it is a far less common combination. The blue is a light, summery shade bordering on turquoise. It has a breezy, nautical feel but is also a bit dressier than the black and tan. I found it looked pretty sharp with a blue suit. Legibility was no problem, day or night. The lume is nice and bright, and I appreciate the fact that everything has a taste of it, including the bezel markers and the tip of the second hand. The tan glows green and the blue, predictably, glows blue. As you can see in the photo, the blue is brighter, but not by much. Scott plans a couple of changes before production. The hands will be slightly wider, and extended so that the tips will reach the markers and graze the bezel indices. The markers will also grow a touch. These changes will also provide more surface area for lume. The 9015 automatic movement should be familiar to micro brand aficionados: 24 jewels, 40-hour power reserve, and a smooth 28.8k bph oscillation rate. It hacks, hand winds, and has a stellar reputation for reliability. 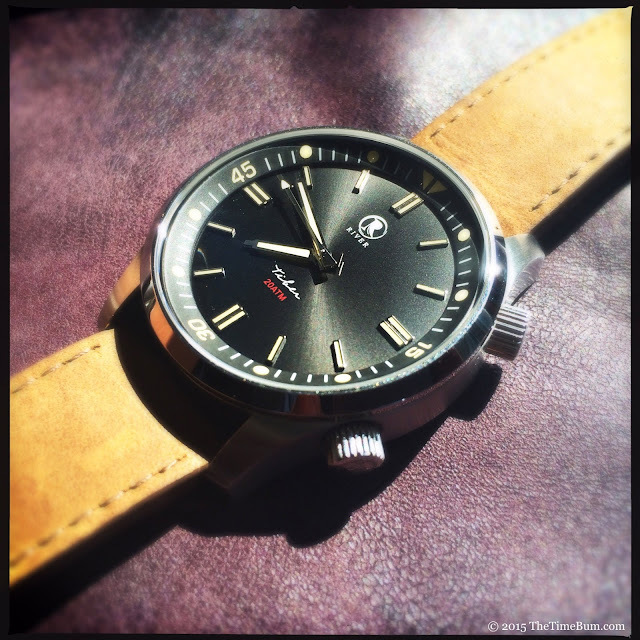 I previously reviewed a G. Gerlach Navigator dual crown and given the similarities between the two watches, it was impossible to resist a comparison. With the black Tiber and the black Navigator side by side, one can appreciate how particular details can change the character of a watch. They are nearly identical in size, but the Tiber is ever so slightly shorter and thinner (about a millimeter or so) and wears smaller as a result. Both watches have mixed finishes, but the Navigator is far less reflective due to its concave bezel and matte crowns. This difference continues on the dial, where the Tiber's sun ray surface and applied polished markers add a sparkle eschewed by the Navigator's flat finish and printed markers. These differences make the G.Gerlach feel like a military watch, while the River is more of a dress diver that would not be out of place with a suit, even though it easily bests the Navigator's 100 meter water resistance. I thoroughly enjoyed my time with the Tibers. They are a conservative design but are neatly designed, and properly executed. Nothing looked like a shortcut or an afterthought. I would be very happy with either color, and with some crafty strap swapping, a single Tiber could take you from a weekend at the beach, to a meeting at the office, to a night on the town. Kickstarter prices will run from $375-425 CAD, (@ $310-350 USD). Pro: Great specs, sharp looks. Con: No waterproof band, but this is easily remedied. Sum: Nicely done, indeed. The Time Bum approves. Interview: Chris Vail of Janis Trading Co.
©2013-2017 The Time Bum, All Rights Reserved. Powered by Blogger. © The Time Bum | All rights reserved.